Nobody Is Stupid – The Bookshelf of Emily J. Have you ever looked down on a waitress, hair stylist, plumber, carpenter, electrician, or welder? 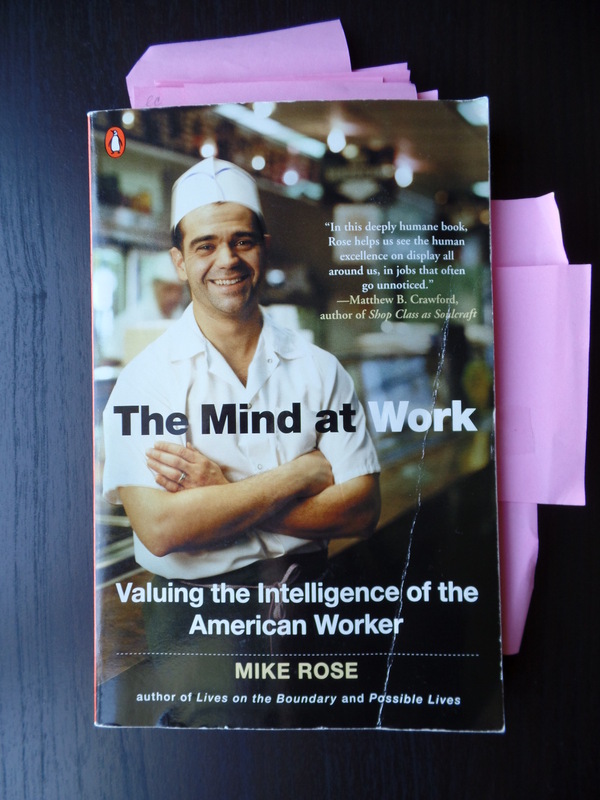 The Mind at Work: Valuing the Intelligence of the American Worker (2004) by Mike Rose addresses the smarts it takes to work in any one of these vocations, and he makes a compelling case for recognizing and appreciating the varied skills and talents of any worker. This book may change your mind about holding onto snooty and hierarchical stereotypes and instead valuing the contributions that everybody makes to society, big or small, rich or poor. He examines “the tension between practical life, experience, and common sense versus schooling, book learning, and intellectual pursuits” (p. 164). Rose focuses on each of the vocations I mentioned above. But most poignant to me was his chapter on being a waitress, for his mother worked as one. He’s an education scholar who has focused on literacy, and he benefited from his mother’s work ethic and her skill. And although he’s written journal articles and theory-rich books, this book is accessible and meant to be read by everyone. He wrote, “One of the truest things I know about my mother and her work in the restaurant is how central that work was to her sense of self and engagement with the world. What I also know from our shared experience is that her choice of work and the meaning she ascribed to it was shaped by the course of her own life history and the web of social and economic forces surrounding it” (p. 3). I love that his overview of his mother’s work and waitressing in general gives credence to the skill and intelligence it takes to multi-task all day long and to work efficiently and effectively with intelligence and dedication. Of the hair stylists Rose met and studied, he noted their ability to convert “personal interest into professional code and bearing” (p. 48). They may have started as young girls with an interest in aesthetics and beauty, but they become, through working in their field, professionals with real skill and talent necessary to success. Also interesting, was the context of the beauty industry. Rose quoted one woman who said, “Women don’t even know what they look like anymore” (p. 51). He sees how the stylists “aesthetic values and technical repertoire are shaped to some degree within this industry” (p. 51). We learn how inviting carpentry can be. “For a young person with an interest in woodworking, the shop must feel like a powerful invitation to competence, a pathway to achievement” (p. 80). I see this as relevant to all of the vocations Rose studied for this book. Although not respected in the same way that doctors or lawyers are, these vocations give people jobs and allow them the same fulfillment and ability to earn and achieve in a field they can excel in. Rose connected this to some of the problems we may identify among young people today. He wrote, “But young people’s lives have many dimensions to them, and, thus, I also witnessed behaviors that are dearly sought in our national assays of adolescent experience. It is as if our collective anxiety is leading us to look in the wrong places, to seek pathology, and, as a result, to miss the whole categories of activities that are principled and contribute to the social good” (p. 104). He wrote this in relation to his time spent with plumbers, noting one particular apprentice who was difficult and seemed to be a troubled youth. Rose saw value in such a young man learning a trade and finding respect therein, for it “satisfies his sense of workmanship and yields benefit to others” (p. 105). Such work allows young people to enter a community and find their value within larger society. One of the main ideas in the book is learning by doing. This is a concept I heard from a professor in my Ph.D. program when I interviewed him about teaching undergraduate technical communication courses. He was adamant that his students had to have hands-on experiences and that they must be able to do what they talked about in theory. That stuck with me, and I was delighted to find it in Rose’s book. When watching a young man named Marcus learning to become an electrician, Rose learned, “It is in application that Marcus’s knowledge gains its power, and this effective use becomes a test of the depth of his understanding” (p. 113). Later, Rose reminds us, “We learn powerful things about the world not only by reflecting on it but also by acting on it” (p. 115). In the section on welders, we find Lisa Legohn, a woman who faces “Men verbally challenging her—What are you doing here? Why aren’t you at home?—or threatening her physically” (p. 117). Occupational exclusion is a theme in many of these chapters, and we learn how much gender plays a role in work and workplaces today. There’s also bias. “[A]s we move to other kinds of contemporary work, consider how these beliefs—inflected with biases about immigration, class, the grime or cleanliness of a task—play out in the way, say, busboys or gardeners, cannery workers or domestics are perceived. As one of the maids in Nickel and Dimed succinctly puts it, ‘They think we’re stupid’” (p. 147). And a major point of Rose’s book is that nobody is stupid. I appreciated his final chapters, which give a rich history of education in the United States and examine just how we got where we are when it comes to education versus experience and college versus a vocation. He highlighted “gender stereotyping and racial segregation” in schools, noting that “Girls were channeled into clerical courses” and that there was “systematic bias at play in the way students get placed in various curricular tracks” (p. 175). We don’t necessarily place students in tracks anymore, but this can be influenced by “parental power and teachers’ and counselors’ beliefs about race and about social class” (p. 175). Of current issues in education, he wrote, “But what is so disturbing on a societal level—taking the school as a miniature society—is that young people at a key developmental juncture have to form their sense of self and their conception of their intelligence within the tensions and restrictions of the academic-vocational divide” (p. 190). Although much has changed in the history of education, Rose is adamant that although “some of these biases about intelligence have been challenged and curtailed, they, altered, mutated, are still with us” (p. 214). His overall point is this: “If we think that whole categories of people—identified by class, by occupation—are not that bright, then we reinforce social separations and cripple our ability to talk across our current cultural divides” (p. 216). I am reminded of Dr. Nel Noddings’ beautiful words about the importance of work and how we should respect those who work, no matter what they do. She focuses on caring and the ethic of care in her academic work; she is also the mother of ten children. She said, in a speech here, that we don’t all need to be uniform and standard. We should respect all jobs, and take our children around town with a clipboard and let them write down what they see people doing. We need to respect what all people do in society and teach them to respect the work and influences of others. She says the idea that you can “go to college or be nothing” is awful. Her work connects nicely to Rose’s, and both scholars helped change my view of education and skilled work. What are your thoughts? This is education worth paying for Emily. Sounds like a very interesting book. I was a waitress one summer while in college an found the work to be very humbling! It took me all summer to learn how to be decent at my job. What a good life lesson for me. I truly believe everyone is intelligent, and that intelligence comes in a variety of forms. Our society tends to measure it based on school performance, education and job success but many intelligent people may not excel in these arenas. What about being wise about relationships? What about smart enough to choose a simple life with a menial job because you prefer it to being a busy professional with a daily grind? Doing what you love and what you are good at, this is intelligent. Looking to society to deem what is important, not so wise. You are so right! My daughter’s teacher has signs in the classroom that outline these types of intelligence. I think it allows the students to see themselves as “smart” in different areas, rather than comparing themselves to somebody’s smarts in one area. Well said. As students, mostly our IQ helps. In life, Mostly EQ helps! Yes, that Ehrenreich book is on my list! I have a copy of it. Rose mentioned it as well. Great connection! Enjoyed serving people more than anything else. Very well said, Emily. I posted on my blog (9-15-13) in a similar vein under the heading, “The Work Ethic and the Dignity of Excellence.” The piece reflects my personal belief that every person should judged against two standards: The content of his or her character and their commitment to excellence, especially when it comes to their trade/livelihood – their contribution to society, as it were. In terms of excellence, it matters not what the person’s occupation; I have just as much respect for a tradesperson who knows and does the job well as I do for a college-educated professional. Yesterday, my wife and I went into a very holiday-busy Starbucks at nearby Santana Row. There was a long line which moved surprisingly quickly. When we got near the head of the line, I saw why. The quite-young barrista was very ably assisted by two other young fellows who worked with enthusiam and clockwork proficiency as the crazy assortment of orders flowed onto the waiting table in rapid succession. One young girl decided she did not want the blob of “whip” on her beverage; the young barrista said, “No problem,” popped the lid, scooped the whip, and returned it with a smile. I have never, ever seen a barrista station operate so efficiency. When the young man placed my latte on the table, I grabbed his and his helpers’ attention and told them, “I’ve been watching you work; you guys are GOOD – definitely the Starbuck’s ‘A’ team.” I could tell they appreciated that someone noticed and cared about they way they did their job. What a cool story! It sums up exactly what Rose gets at in his book, that there are skills we sometimes discount because of where they occur, but that they are important and worthwhile nevertheless. I’ll look into your post from last year. What you wrote here reminded me of other ideas I’ve read about efficiency, and how that is a very American value. Some theorists have criticized what they call the ethic of expediency, as maybe we go for that over other things. It is fun to think about how all of these ideas work together and bounce off of each other. Thanks for the great comment! You raise a good point about possible American overemphasis on efficiency at the expense of other virtues. With respect to the Starbucks barristas, their performance and enthusiastic demeanor said less to me about “time is money” and much more about attitude and pride in the service they perform. That experience at Starbucks and the excellent movie we saw right afterward literally made our day! me again. so i guess i don’t really agree with ur headline; there certainly ARE stupid people, but their profession, class, gender, or whatever is not what dictates that. 🙂 I KNEW somebody would take issue with the title, because certainly it isn’t ALWAYS true. I should’ve known it would be you that would point it out. But don’t you think that everybody has potential or at least one thing they are good at? Maybe I’m stupid at math, but that doesn’t make me stupid at everything. Yikes. When I grew up, we were forbidden from using that word. It’s awful and I’ve taught my daughters the same. I’ll use foolish or ignorant or silly, but never that word. I love the idea in this book. While I write I also work and have worked in many of these jobs. People need to respect all jobs. This reminds me of what my Mom, who is a school teacher, keeps saying in regards to public schools and the push for college after high school for all kids. She says what really needs to happen is a more equal valuing of trade school and non-college skills sets. I feel this is especially poignant right now as college costs and student loans are grossly prohibitive for most Americans. This very thing has played out in my own family as my Mom went to college, I went to college, but my brother didn’t want to take out life-long loans on college, so he learned a trade (pest extermination) and he is certainly no less smart for it. Great example. There can and should be a place for everybody, and that doesn’t necessarily mean that we all take the same path. Thanks for sharing your experiences. Emily, I appreciate your review on this book. I will definitely check it out. I worked as a bank teller for years and it surprised me how often I was dismissed or people assumed so much based on my job. The kindness we offer people (no matter what their title, education or role) is a trait I emphasize for myself as well as my daughter. There is value in all work. Well said. I think the kindness we offer others, no matter their station, says a lot about us as individuals. I’m sorry you had some hard experiences as a bank teller. Hm sounds fascinating. I’ve been trying to read more nonfiction as a counterbalance to what I call My Year of YA, since I’ve been reading and reviewing almost nothing but young adult. Will have to add this book to the nonfiction reads. I hope you enjoy this one. A year of YA sounds delightful! When I see other people at work, I think two things: 1) I’m glad they are employed, and 2) thank goodness there are people out there who have the skills and talent to do the job they’re doing. As a former human resources executive, my job was to maximize the talent in the organization. I worked with many highly educated people and learned a lot from them. Nevertheless, with or without a college degree, I admire the individual who is contributing to his/her family and to society. My father was an ironworker and my grandfather was a milkman. Both of them modeled a strong work ethic. How neat that you honor your relatives. And it sounds like you have a lot of experience seeing this first hand and helping people find what they are good at. My great grandparents were cannery workers. Whenever I take the time to remember that, I’m grateful for how far I’ve come, but I appreciate those who do what they can to survive and who do what is best for them as individuals. I have to say that in the ten years during and after graduate school when I couldn’t find professional work, I did many things. None of them were easy, but waitress was one of the hardest jobs I ever did. I’ve never worked as one, but I’ve always thought it seemed difficult, demanding, and thankless. It certainly is hard work. Thanks for sharing. Yes, I actually really hate going to work when I worked as one, even though I had several people tell me I was good at it. It was one of those jobs where for hours before you have to go to work, you dread being there. Thomas Carlyle stated it perfectly. ” Every man is my superior in that I may learn from him”. Every one has a talent and aren’t we thankful that not everyone has the exact same talents. One can also have a lot of book smarts but lack a great degree of common sense. Some people are hands on people and some are not. It does not make the ones who use their hands any less bright than those who use their heads for a living. Absolutely! You put this so nicely, and I love the Carlyle quote. That pretty much sums up life. In “What is intelligence, anyway?” Isaac Asimov talks about the same issues. He discusses his mechanic’s aptitude, his own lack of practical common sense, and ponders how the world decided one is more important than the other. Great discussion! Nicely said. I agree…we should keep this in the forefront! Thank you so much for writing about this book, Emily. I’m so grateful to my parents for demanding that we treat all workers with respect; as an adult, I know it’s a good bet that one is best off avoiding other people who are rude to waitresses, sales staff, or maintenance workers. And I agree with that professor: the ‘college or nothing’ attitude is incredibly grating. My husband is a skilled professional who didn’t graduate from college, and I cringe every time I hear someone voicing that opinion. You’re right! It isn’t helpful to pit us against each other and to engage in such black and white thinking, especially when it comes to valuing others. Respect is key. Thanks for adding to the conversation. Your parents sound pretty neat. I saw way too many cruel people while working in retail as a teenager. They automatically assumed I was stupid, a high school dropout or a teenage mom even though I was in college. I wish every single person who has looked down on someone and their jobs could read this book. Great post. I’m sorry you had those negative experiences. We should make this book required reading for everybody! Thanks for commenting. Believe it it not, this is one of the reasons my favorite book is “North & South” by Elizabeth Gaskell! The whole concept of valuing the individual and seeing the intelligence and character of the ‘menial’ workers is an important theme. Besides, I don’t believe anyone is above anyone else in character until proven by daily merit. Hard work is hard work whether it’s digging through legal briefs in the white collar world, or standing all day scanning items and being pleasant to strangers as a grocery cashier. Perfect example! North and South, although not my favorite book ;), is definitely about class issues and workers and how we might be valuing the wrongs traits in people. Great connection. Love it, and thanks for sharing! I love this conversation. One area of my life that has really caused me to think about this a lot is my children’s experiences at school. All of my children are smart, but in different ways. My son’s interests and ways of learning are especially different, and school is not always set up well for him. He doesn’t experience the kind of positive feedback that my daughters do, because he is just not interested in sitting and learning. He wants to take things apart and put them back together. He wants to explore. I wish they had more ways for him to feel like he is succeeding. I wish he had that too. It is hard to accommodate everybody’s strengths and learning styles, but that should be the goal of school. We should try! I hope that your son finds ways to accomplish and be praised as he continues his education. Pingback: “I’m Not a Feminist, But . . .”: Care-Focused Feminism | The Bookshelf of Emily J.
I’ve found that the reverse can also be true. You shouldn’t assume that someone is automatically intelligent (or consistently makes wise decisions) based on his/her college degree. I interacted with many students in college who were smart in some ways, but chronically lacking in empathy, among other traits. I often think that the professions people end up choosing have much more to do with the opportunities they were given in life than with their “pure” intelligence. You are so right! A person with many degrees might be “smart” at their field, but maybe not smart at relationships. And yeah, sometimes we work where there’s opportunity, rather than what we are truly drawn to or intelligent at. Thanks for this!